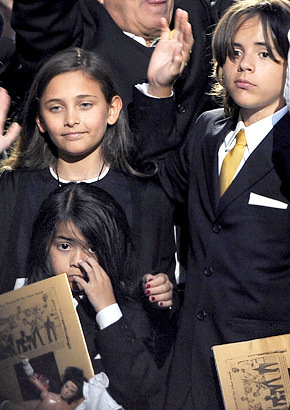 After Tuesday's sad, touching memorial for Michael Jackson, his three children seemed to be in better spirits at the post-memorial reception immediately following the service. Prince Michael, 12, Paris Katherine, 11, and Prince Michael II (Blanket), 7, all sat in the VIP area at a kids table with all their cousins. They were apparently all "playing and goofing around."